Tonight I picked up the remaining part of my kit at the team meeting at the Mencap HQ. Once I got home I was eager to put everything into the 25L OMM rucksack and weigh it. 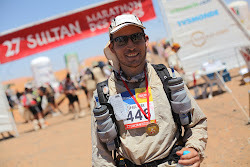 David at Sandbaggers had originally recommended the 32L OMM rucksack as the perfect size for the MDS, but I told him that I wanted to take the minimalist approach and asked him if a smaller lighter rucksack was also possible. He said the 25L was also possible, but that it would be a very tight fit. I was a little bit worried looking at all the food lying on the bed, and wondering if I was going to be able to fit everything in. I began by packing all of the survival items (aluminium blanket, signal mirror, sun cream, venom pump, first aid items, whistle etc) in the top pocket. Then I started filling the main section of the rucksack with food. There are over 20 packets of freeze dried food so that takes up most of the space in the main section, but there was just enough room left at the top to fit in my sleeping bag and fleece. In one of the side pockets I managed to fit my windproof jacket and pants, and in the other pocket I managed to squeeze 2 large recovery drink packets and a spare pair of socks. So basically everything is now in the pack other than a knife, compass, safety pins, lighter, sand goggles, hand disinfectant, plasters, camera (my only luxury item) and 3 AAA batteries. I may also take my silk sleeping bag liner and a few energy bars depending on space. When I weighed the pack it was 6.9kg (a very pleasant surprise). If you allow for the items I mentioned above that are not yet in the pack then it will be around 7.5kg, which is exactly what I was aiming for, so my estimate was almost spot on. Although the main section is at present pretty full, after I have eaten a couple of the packets of food it will no longer be a squeeze and it will be easy to unpack and repack it. Even after adding in the extra items above, there is still a little bit of spare room in the pockets, which means the important items will be easily accessible. It is going to make a big difference running with a lightweight pack like this, rather than one that weighs over 10kg like some people carry. The only thing that remains to be seen is if I have sacrificed too much comfort in order to save weight. If I have then that will just have to be a lesson for the next time I do it (wink wink). I think I will manage though, and the main concern of warmth at night should be covered by the fact that I have a fleece with me and can go to bed wearing that if necessary. Or it can serve as padding to lie on if I don't need to wear it. I am also not scrimping on the calories, as that is important for recovery. I plan to take a few more than the mandatory 14,000 calories and there are already over 15,000 in my pack without any energy bars (which I will add in later).